I had not planned on going to Frjtz, which I knew from its dark days in Hayes Valley. I never cared much for the place. Mainly because I thought the “frtjz” were oversold (check out the fries at Trick Dog, instead). Why not? I called and ordered a fried chicken sandwich, thinking it would come with a waffle. My bad. The standard sandwich, the menu version, the one you get when you don’t say “waffle,” comes on a bun. A brioche-type bun. Kind of sweet. Otherwise disappointing. Inside the bun is a slab of chicken, not unlike the cut you get from Los Picudos, a single piece of breast meat. Breaded more than battered, like the milanesa, but without Picudos’ spices and pounding. OK, the chicken may be tasteless inside, but how about that beautiful breading? Tell us about the seasoning, the crisp, the crunch! Zero. Zip. Nada. I felt betrayed. Worse, I felt sautéed. The sandwich comes with a spicy mayo (chipotle), which we on the north side call “aoli,” but which Frjtz, perhaps seeking membership in the EU, insists on calling “remoulade.” Whatever word you choose, it added zest to an otherwise boring sandwich. Julian, since you are a fan of pickled onions and perky dry slaw smothered in spicy “remoulade,” you will probably find a lot to like here. Pity the poor reader who believes you. P.S. My brother plays “Waffles” in Cutting Ball Theater’s new Uncle Vanya, running through 10/21. With a couple shots of vodka, far more soulful, and funnier, than the Frjtz fried chicken sandwich. Dirty plates everywhere. A fake, blank-white taxidermied deer. Chairs depicting female legs and rear ends. A mosaic of the Last Supper on skateboards? I never understood this place that was on Valencia Street, and is now around the corner, on 17th Street. Even with the new decor, I still don’t. The sandwich comes and the waiter sets it down gently with viola-type hand motion, almost like he knows what I’m up to. I munch on the fries first, which are thick-cut and double-fried. Much, much better than last time. There are two kinds of double-fried French fries: (a) when you actually double fry them and (b) when you just throw old, cold fries into the deep-fryer to heat them up again. These are, unlike my last experience, closer to the former. But the sandwich — wow! Good! A total surprise! We can look past the fact that the chicken isn’t juicy, maybe even a little chewy, because the whole experience is accented by an overwhelming Cajun flavor that hits you upon the first bite. When I close my eyes, I think I’m eating a hot-link sandwich, especially with the rubbery sausage-like texture of the chicken. 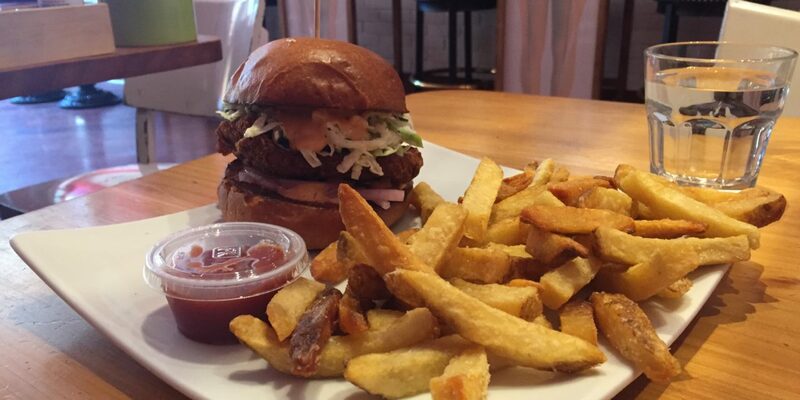 The rest — slaw, brioche bun, curry ketchup — definitely takes second fiddle. It’s almost as though this sandwich doesn’t know what it wants to be. Mark: I was not looking forward to this. I was not looking forward to seeing the tacky fake candles and eating a fried-chicken sandwich while laying down in the furry window display. But I did neither — instead I ate a chicken sandwich that, with a little bit of counseling, could really come into its own one day. P.S. : I walked by recently, and the fake candles have returned.